has charge of baggage in holds and issues it on specified days (baggage days); cf. baggage master (on shore) (739). bakes bread, cakes and pastry on liners and other large vessels; on smaller vessels, this is done by cook q.v. a member of Asiatic crew, serving under Lascar Agreement; cooks for Asiatic crew, and is specially qualified in cooking rice and East Indian dishes, \barber; has charge of hairdressing saloon on liner; cf. barber (920). assists bar steward q.v. in serving refreshments, washing glasses, etc., or, on large liner, has charge of one of ship's bars under general supervision of bar steward. waits on officers or passenger in answer to electric call ells. cleans boots of passengers, fetches hot water, and does odd domestic work. (liners only) sounds call for passengers' meals; helps generally in dining saloon. cuts up and dresses meat, poultry, game, etc., for cook q.v. ; has care of meat, etc., in safes and cold storage chambers; when live sheep, etc., are carried on board ship for consumption, kills and dresses animals; also takes charge of cats, dogs or other livestock belonging to passengers or carried as freight; sometimes specifically designated, e.g. chief butcher, second or third butcher, assistant butcher. does work of captain's steward q.v. in small vessels, or assists captain's steward in large vessels. assists dock labourers (745) q.v. in driving cattle or sheep up gangways on to ship, and in fixing deck pens for their accommodation; feeds and waters cattle, etc., at regular intervals during voyage, and sees that they are securely penned; cleans cattle deck at stated intervals or as required; is usually engaged by exporter (one cattleman for each fifty head of cattle) and does not form part of ship's crew. is chief cook, cf. cook, on large liner. assists purser q.v. in keeping ship's accounts, passenger lists, wages account of crew, and other clerical work; on large passenger liners, is assisted by assistant clerk q.v. under supervision of purser or of clerk q.v. does clerical work in connection with ship's accounts, passenger lists, crew's accounts, etc. ; employed only on large passenger liners. on large liner, under direction of chef q.v., keeps accounts of ship's provisions daily and renders such accounts to purser q.v. ; also assists generally in ship's kitchen under direction of chef; cf. clerk. prepares meals for crew and passengers (where latter carried); on large passenger liners, where several cooks are carried; often specifically designated, e.g. chief cook (or chef), curry or sauce cook, entree cook, fish cook, roast cook, soup cook, vegetable cook according to dish in which he specialises; cf. cook (900). assists cooks generally, preparing vegetables, etc. a boy employed as engineer's steward q.v. or as assistant to engineer's steward. directs and supervises cattlemen q.v. ; is responsible for their work being efficiently performed; attends to injured or sick cattle during voyage, and gives them simple medicines if required; supervises embarkation and disembarkation of cattle; is employed by cattle exporter and does not form part of ship's crew. is in charge of horses carried as cargo on board ship; supervises their feeding and watering and general welfare. answers passengers' enquiries (especially foreign passengers') and gives information regarding ship's routine, ports of call, etc. 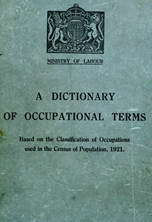 ; translates and explains notices issued by ship's officers, for foreign passengers; conveys and interprets complaints or other communications from foreign passengers to officers; on emigrant ships, must be familiar with dialects spoken by emigrants of those races for which his company especially caters. assists cook q.v. generally, chiefly by washing utensils. Is in charge of library and reading rooms on liner; issues books to passengers, advises them as to suitable reading, assists them in searching for information in reference books; places magazines on reading room tables, etc. works passenger lift between decks on large liner. is in charge of sheets, pillow cases, towels, table linen, etc., on board a passenger vessel; issues clean linen to bedroom stewards and stewardesses q.v., as required, and receives soiled linen from them; bags soiled linen in readiness for prompt despatch to laundry at destination; keeps records of stock of linen and of despatch and receipt of packages to and from laundry. patrols ship with a view to the prevention of petty misdemeanours among passengers or crew; obsolescent, but where found (large liners only) is regarded as under instructions from chief steward q.v. attends to comfort and welfare of children and of unaccompanied women on board large liners, especially of those in third class or steerage, or on emigrant ships; in latter case, is to some extent responsible for their conduct and discipline; is usually a professional nurse; sometimes also does work of chief stewardess q.v. assists in waiting, cleaning, etc., in officers' mess. fetches and carries pantry stores (meat, milk, tea, sugar, etc. ), and, as directed by pantry steward q.v. stows them or issues to cooks and stewards q.v. ; assists in issue of crockery to those ratings and in stowing on racks and shelves when returned; assists pantry steward generally. pulls rope or cord with regular intermittence to swing punkah (piece of cloth attached to a suspended rod), thus producing a current of air in cabins or saloons, when ship is in tropics. acts as clerk to master (733) q.v. and conducts his correspondence when in port; is responsible for custody of ship's monies and keeps ship's accounts; has custody of crew's discharge books and wages accounts; changes money for passengers; makes any necessary adjustments to passengers' tickets during voyage; takes charge of passengers' valuables; on large ships, especially passenger liners, is assisted by clerks and assistant clerks q.v. keeps saloon tidy and attends to passengers' wants. a member of Asiatic crew, serving under Lascar Agreement; keeps lavatories clean and tidy, and is employed in cleaning and sanitary work generally, for Asiatic crew. is in charge of bar and serves passengers with wine, beer, spirits, etc., thereat; makes return to chief steward q.v., periodically or as required, of stocks of wine, etc. makes passengers' beds, replaces soiled bed linen with clean linen obtained from linen keeper q.v. ; keeps passengers' cabins and sleeping berths clean and tidy; serves meals in cabins to sick passengers and waits on passengers in their cabins generally. waits on master (733) q.v. at meals, cleans his room and cabin and acts as his servant generally; cf. captain's boy. is responsible to master (733) q.v. for catering department of ship, for efficient service of meals, and for comfort of officers and passengers generally; orders supplies through victualling superintendent (739) q.v. or (usually on small vessel) direct; has staff of stewards, and sometimes also of stewardesses, cooks, butchers, bakers, q.v. etc., to assist him; supervises their work and (on smaller vessels) engages them; on smaller vessels, sometimes also does work of purser q.v. serves meals in engineers' mess-room; lays and clears tables; makes engineer officers' beds; keeps their cabins clean and tidy and waits upon engineer officers (734) q.v. generally; cf. steward, mess-room. serves meals in navigating officers' (733) q.v. mess-room; lays and clears table; usually also keeps navigating officers' cabins and saloon clean and tidy, makes their beds and waits upon them generally; cf. steward, engineers'. is responsible to chief steward q.v. for keeping ship's pantry stores (meat, flour, sugar, tea, tinned foods, etc.) and crockery; issues stores to cooks or stewards q.v. as required; puts away crockery returned after use, on shelves and racks; keeps record of stores received (at beginning of voyage and after replenishment in port) and of stores issued. arranges anti clears tables for meals, waits on passengers travelling first or second class, keeps saloon clean; sometimes specifically designated, e.g. first saloon steward, second saloon steward. combines duties of cabin steward and saloon steward q.v. for steerage or third class passengers. prepares passengers' meals on pleasure yacht; lays table for meals and clears it thereafter; makes beds, keeps cabins clean and tidy and waits on passengers generally. makes beds in, and tidies women's cabins, serves meals therein if women or children passengers are sick, looks after children if mothers are ill and waits upon women and children passengers generally, especially those travelling unaccompanied; if cabin duties are light, sometimes spends part time in repairing bed and table linen, under supervision of linen keeper q.v. ; often specifically designated, e.g. bedroom stewardess, cabin stewardess, first saloon stewardess, second saloon stewardess. is responsible to chief steward q.v. for general supervision of stewardesses q.v. and for allocation of their duties, where several are carried; arranges generally for attendance on women and children passengers and for their welfare, especially if they are travelling unaccompanied. has charge of ship's stores on board ship, receives and issues same and keeps records thereof; is sometimes assisted by assistant storekeepers, whom he supervises; on large ships, is usually specifically designated according to type of goods handled, e.g. bar storekeeper (beer, wine, etc. ), deck storekeeper, engineer's (or engine room) stock-keeper, storekeeper (also known as oilman), victualling storekeeper (flour, meat, etc.). a member of Asiatic crew, serving under Lascar Agreement, who attends to livestock (sheep, goats, poultry, etc.) carried for victualling Asiatic crew; feeds and waters stock and cleans their pens; when not so doing is engaged on cleaning jobs, etc.